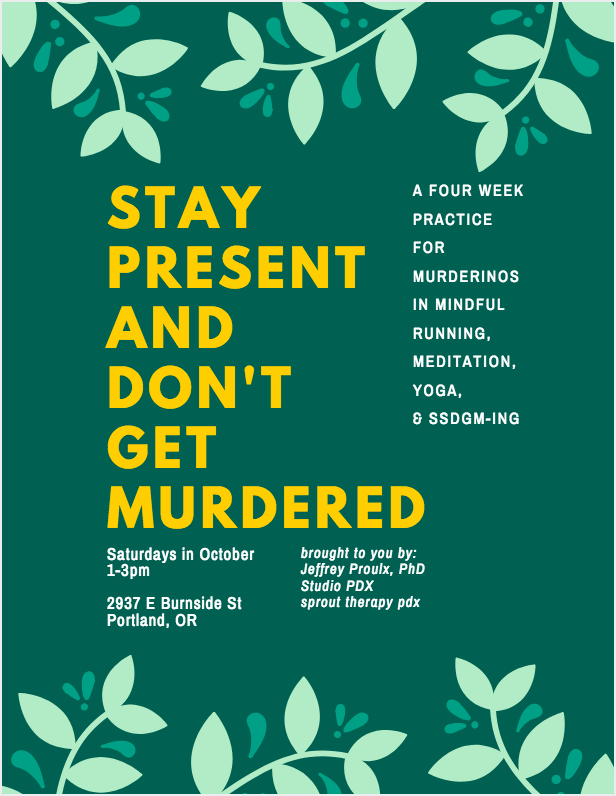 Join OHSU psychologist and researcher, Jeffrey Proulx, PhD, therapist Emelie Gagliardo of Sprout Therapy PDX, and the lovely yogis at Studio PDX in a pilot seminar for mindful running, stress reduction, and yoga! This exciting program will be offered for F R E E on Saturday afternoons in October out of Studio PDX in SE Portland. This seminar will be loosely based on themes from the true crime podcast My Favorite Murder and will be offered for clients, followers, and Portlanders who love Georgia, Karen, Steven, and their animals as much as we do! RSVP on our FB event if you’re interested in participating in this program! It’s a great opportunity to learn a lot about yourself, your mind, and your body... also did I mention it’s free? ?